Jerez de la Frontera (Spain), 5 September 2014 – In the two free practice sessions on Friday, the first day of the tenth World Superbike round, Marco Melandri and Sylvain Guintoli were at the forefront. Marco proved to be fast straight away, taking the best time in the morning free practice session with 1’42.768. In the afternoon session Melandri focused more on fine tuning his RSV4 with race pace in mind, as well as working on tyre duration over the 34 laps he put in. This was a choice which in any case did not keep him from ending the day with the second spot in the combined standings for the two sessions. Marco Melandri: “I’m very pleased because after almost two months off the bike getting started again is always a little daunting. Instead I noticed that both the guys on the team and I still remember well how to work together and I felt good in the saddle with my RSV4 working great. This afternoon in the high temperatures I focused on pace without trying to improve my time. We are off to a good start, so we’ll keep going in this direction”. Sylvain Guintoli applied the same work method. The Frenchman, currently lying second in the championship standings, improved in the second session to finish in eighth place in the combined standings but only three tenths off the best time, a result that speaks volumes about how even the playing field was on this first day of practice. 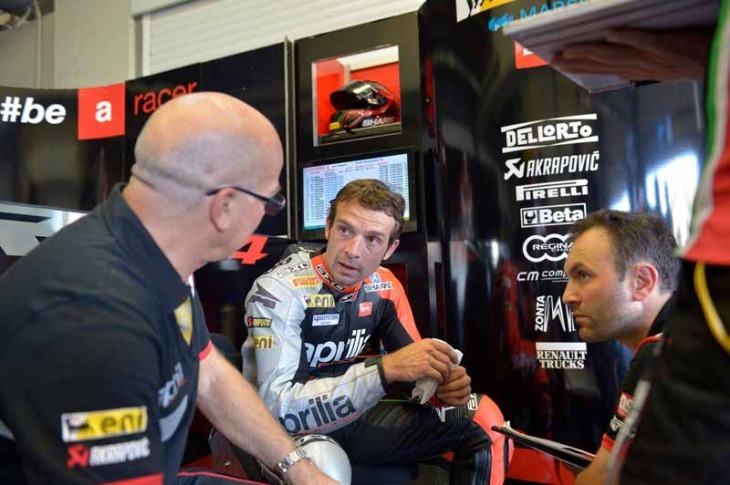 Sylvain Guintoli: “We are all really very close. After the long break it was important to find our pace, especially on a twisting and demanding track like this one. In the afternoon I managed to improve my pace, trying to finish the race distance on my tyres. As first days go, it was good. We’re working with the race in mind and our claws will come out in Superpole tomorrow and then again in the races on Sunday”.